This is the best Ahmed could come up with to be his date to the prom. We'll dig up a winner Saturday. Oh, and while you're dreaming up a caption take a minute and nip on over to Tribal Blogs where you can vote for me to have a $300 blog makeover. They'll dress me up and take me anywhere if I win so please, please, please (thank you James Brown) show the love and click in the circle next to my name, or my noname. Tell them dufus sent ya. No bones about it, you went tribal this week! Old Chef- long tounge and mini lost teeth. Yes "Chef" note his hat! Alas, poor Yorick, I knew him well. OMG. I cannot caption this. I am too busy gagging! I promised to love, honor and tongue kiss way into the afterlife I loved that much. New terrorist weapon, the " ICD", improvised communication device. Giving jihad a " heads-up", of incoming threats! And for those who have given up all hope of ever meeting their soulmate, there is Plenty Of Freaks dot com. Even after death, Rob stayed close with his twin brother Bob. Rob & Bob, conjoined twins famously sharing one tongue. 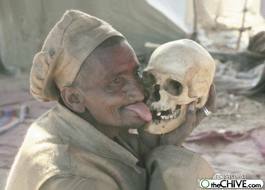 Ahmed couldn't remember who the skull belonged to but it was on the tip of his tongue. You never want to be last in line at the cannibal buffet.